In this deeply enjoyable and attractive little picture book, an acclaimed poet and renowned artist collaborate to produce an illustrated compendium of familiar stories, made new by the style of their retelling in words and images. The story begins with a monkey overhearing two parrots talking about a recital of the Tale of Tales that is to be told that day at the Volcano Valley. His journey to the valley becomes a Chaucerian pilgrimage as creature after creature joins him, each contributing a tale suited to its proclivities. These are set out in italicised intervals between each linking passage, taking the form of artfully rhyming narratives in a variety of sprightly rhythms. Amongst the reconstructed classics are the Blind Men and the Elephant, Rip van Winkle, and Anansi’s encounter with the Big Snake. Bailey’s silhouettes, black ink line-drawings and intricate hatchwork provide an intriguing accompaniment. His drawings of the man-eating hobyas emerging at dusk from a forest are particularly chilling, though Mitton keeps the mood light-hearted by sparing the young reader the bloodiness of the original. 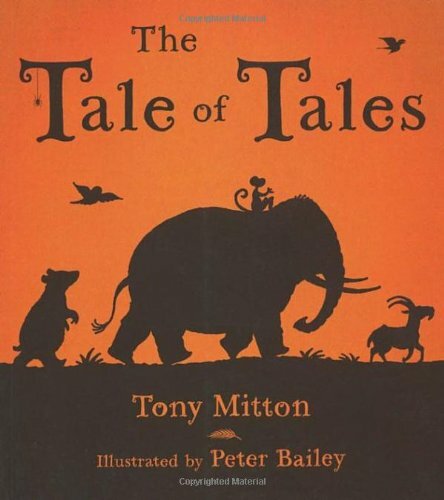 This is an excellent book for reading aloud, and provides a very promising model for showing children how stories can be recreated.